Our range of Drum Racks not only holds drums securely, but also incorporates containment for drips that might otherwise happen when supplies of oils or chemicals are drawn off. We also have shelves that fit between pairs of drums to form a secure and stable drum rack. 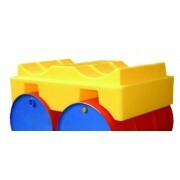 Stores drums horizontally, for use with Poly Stacker Base. 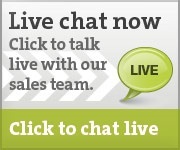 Stores 2 x 205 litre drums. Add the Single Poly-Stack to your Single Poly-Rack to increase capacity to hold two 205 litre drums. Space-saving and economical solution to storing and dispensing from 205 litre drums. Polyethylene constructed will not rust or corrode. Each Poly Stacker holds two 205 litre drums. Can quickly be stacked with a forklift. Spills for the second level fall into the the dispensing well for containment and easy clean up. Maximise working floor space with the Multi-Purpose Racker/Stacker. Holds up to two 205 litre drums. 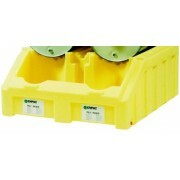 Can be placed on the floor (no sump) or alternatively on Slimline 4 Drum Spill Pallet. Load bearing up to 1089kg. Fully sumped base for use with Stacker Unit. Space-saving, economical solution to storing and dispensing from a 205 litre drum. Will hold single 205 litre drum. 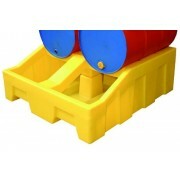 Can be added to with the Single Poly-Stack to hold two 205 litre drums. Sump capacity 250 litres and load bearing up to 726kg. 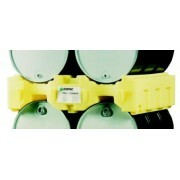 Poly-racker base unit holds two 205 litre drums securely. 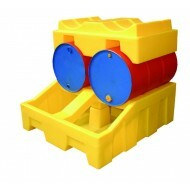 Massive containment sump ensures spill safety. The dispensing well is designed to contain incidental spills and splashes without contaminating the sump.